On Friday 30 November representatives from Warwick District 4 Europe met with Jeremy Wright, MP for Kenilworth and Southam, to ask him to join us in supporting the calls for a People’s Vote. 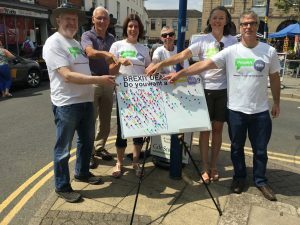 Ahead of the meeting, we held street stalls in Kenilworth and Southam, talking to his constituents about their views on Brexit and asking them to write a postcard to their MP telling him they were in favour of a People’s Vote. 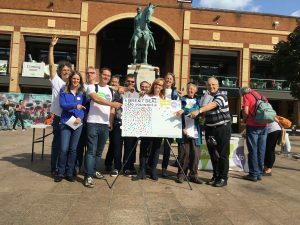 In just 2 hours in Kenilworth on 17 November we collected over 100 postcards and our Brexitometer showed 88% of people we spoke to were in favour of a People’s Vote. In Southam there was also a clear majority in favour at 58% and another 26 postcards were filled out. The street stall in Kenilworth featured in the local press a few days later and the article was retweeted by Matt Western, MP for Warwick and Leamington. 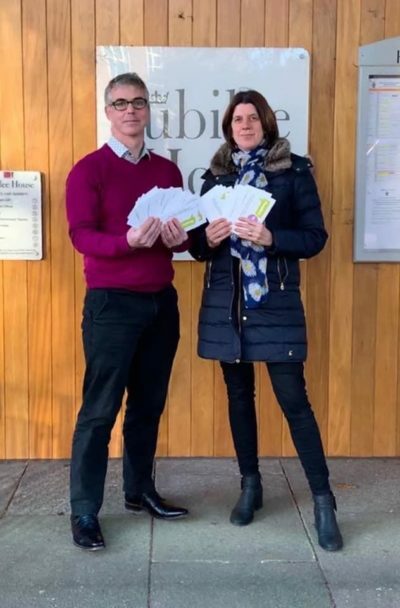 At the meeting, Chair Peter Corkill, and Communications Officer Alison Eason, handed over the 140 postcards, a total that Jeremy Wright described as ‘very impressive’. We told him about Warwick District 4 Europe and gave him the results of all the street stalls we have held in his constituency since June. We explained to him why we believe he should vote against the Brexit deal and why we believe the public should have a final say. 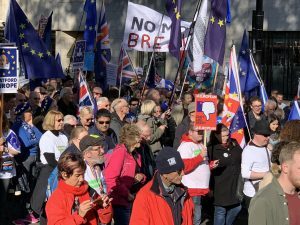 He outlined his position, that he supports the deal and opposes a People’s Vote, though he would not speculate what would happen if the Government could not get the deal through Parliament. We continue to encourage constituents who share our views to write to him and to keep up the pressure, not least because he will have a voice in discussions in Cabinet. He said he had received about equal numbers of letters on either side of the debate. Let’s change that.